Memorial Update and News | F.F.A.M. It is with profound sadness that I must open my article with not one but two line of duty death (LODD) announcements. 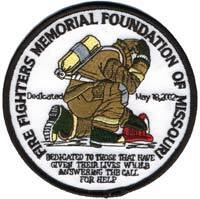 Since the last newsletter our state finds itself having honored two LODD’s and both very shortly after our May 21, services in Kingdom City. Firefighter Jesse Ketchum with the Memphis Fire Department passed on May 29, and Firefighter Jeffrey M. Sanders with the Mayview Fire Protection District passed on June 19. I also wish his partner a speedy recovery. Your foundation now sets about the task of honoring their sacrifice in the May 2018 services. Several of you reading this article assisted with arrangements and honoring department/family in one or both community services. Thank you for doing so. The DVD’s from the 2017 services will be available for sale by the time your are reading this article. It has the candlelight and Sunday morning service on one DVD. If you were not able to attend and need one or attended and forgot to sign up for a copy please contact me. Cost is $10 or $12 each if mailed. The foundation remains very much aware of the discussions on cancer in the fire service and the national conversation on cancer presumption. For those of you which follow NVFC on Facebook you have seen the Don’t be a Drag illustration as part of the Serve Strong campaign. It makes some very good points with getting tested. As previously indicated the foundation is attempting to follow with national on LODD but open for other information plus questions surrounding the possible medical links and what may be asked of the foundation. I previously discussed this but it is worth repeating there are five key representation positions that are foundation board members concerning this subject. The Missouri Council is represented by President, Sherwood Smith. FFAM is represented by President, Kenneth Hoover. The State Fire Marshal office is represented by State Fire Marshal Tim Bean. NFFF/Missouri Assistance Teams is being represented by Brian Zinanni. By FFAM appointment I am the NVFC Representative for Missouri. While there are several other organizations having a highly vested interest in this subject, I just wanted to disclose these connections within the foundation and the national conversation on cancer. Finally, it has been a long time in coming but thanks in large part to Bill Farr and his family business the foundation finally has an official uniform shirt. This is the short sleeve version and the three colors do have a symbolism. Red is for sacrifice and that is what the foundation honors both as LODD and regular service regardless of time. White is for purity and the purist of ideals we try to put forward in our service to each family, extended family, friends and those having an interest in the fire service. Gold is for the standard we try to follow in process and best practice. A long sleeve is in the works but that reveal will follow when it is time to wear long sleeves.